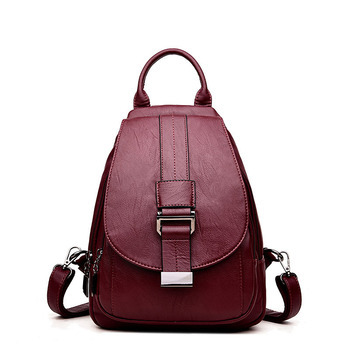 High-quality materials, elaborate craftsmanship, and multipurpose design, this Fashion Womens Genuine Leather Backpack are the most important features of this women’s stylish and fashionable backpack. 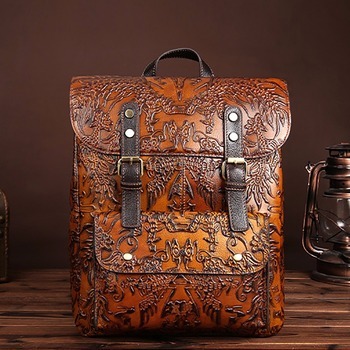 This is a simple cute genuine leather backpack. You can fit enough items in it and treat it like a normal purse as well. It comes with a detachable strap; you can use it as a daypack, travel backpack or shoulder bag. This backpack comfortably holds your daily essential needs- an iPad, iphone6s plus, wallet, cosmetic, and other daily things, perfect to use as a daily bag for working, shopping, working or dating. Accurate description of the backpack. Soft leather. Made with high quality and accurate. Inside the backpack unexpected small gift, wooden cat keychain. Shipping Rostov region in 10 days. Thanks to the store. Well packed in a bag. Nice backpack. Good, Light, and looks great. Fast shipping (2 weeks) to the city. Fits the description, the store put small souvenir. I Recommend. Love the backpack very much!!! My daughter ordered for school (8 grade), textbooks. Delivery to Rostov 12 days!!! Thank you very much!!! Excellent backpack, but had to leave on the balcony for a couple days because of the smell. Very beautiful bag. Can hold a lot of things inside but doesn't look huge. Thank you for quality products, and very fast delivery. Well packed. AND a special thanks for gift))) are very nice! Goods delivered by courier, quality, seams material very good, ordered her, like, store very sociable shipping 13 days to Saratov, seller recommend a feel free to order!!! It is not genuine leather, and leatherette. Order reached 11 days in Belgorod region. Drained very carefully. No smell. Backpack is very cute P comfortable. A lot of pockets, that will optimize storage in the way any necessary small things. Thanks to the store.